A Sanctuary in the City ! Experience living in Mandaluyong City with a vast golf course as your immediate neighbor. At the Shang Residences Wack Wack Mandaluyong, a luxury resort-themed exclusive residential property, your everyday living will never be the same. The Shang Residences Wack Wack is a single building condo community for sale in Mandaluyong City towering above the landscape of the metro. The tower stands 50 stories high situated in a 3,361sqm of prime land overlooking the famous golf course and the magnificent skylines of Mandaluyong, the city of Makati, and other magnificent views of Metro Manila. This condo property offers only 460 residential units which range from a One-bedroom, Two-bedroom, and Three-bedroom units. There is also a penthouse consisting of duplex units. This elegant residence in Mandaluyong has what it takes to be called as a sanctuary in the city because of its truly verdant environment right in the middle of a bustling metropolis. The Shang Residences at Wack Wack is the latest project of Shang Properties, Inc. (SPI) and is set amid the iconic Wack Wack Golf & Country Club, Metro Manila’s epochal heritage golf club. The residential units at the Shang will have sweeping views over two 18-hole championship golf courses to the north, the cityscape of Makati to the south, the majestic Manila Bay to the west, and the Ortigas Center to the east. Furthermore, the condo community will be having some of the industries’ most admired amenities and building features which provide comfort and convenience to the unit owners. With the more competitive price per unit compared to other high-end condo developments in Mandaluyong, the Shang Residences Wack Wack is going to be the future residential enclave and a private retreat for the city’s busy professionals and even the upgrading families. The Shang Residences Wack Wack is located along Wack Wack Road, Mandaluyong City, a site that is also near the Star Mall EDSA Cinema, S&R Membership Shopping, Robinsons Galleria, St. Augustine School of Nursing Mandaluyong, the Saint Pedro Poveda College, and the Cardinal Santos Medical Center. Moreover, the property is just a few meters away from the four-lane Shaw Blvd., less than 600 meters from EDSA, and opposite Ortigas Ave. to the north (less than 1km away). These major thoroughfares and other road arteries near the Shang Residences will make your everyday commute to work or business transactions more convenient and quick. Luckily, you will be able to live in a location that is not only a cut above the rest but also a place where serenity and safety abound. SPI is committed to bringing you a resort-inspired community with lots of well-designed spaces enhancing growth, health, and well-being of every resident. The Shang Residences Wack Wack is a glorious treat for those who want bigger space that truly breathes as their abode. This impressive condo community boasts of larger residential units compared to other upscale residential developments in the Mandaluyong area. This well-planned community has its amenities floor right at your doorstep. The ingenious modern design of your new home is a collaboration between internationally-acclaimed architects, engineers, and designers known the world over. 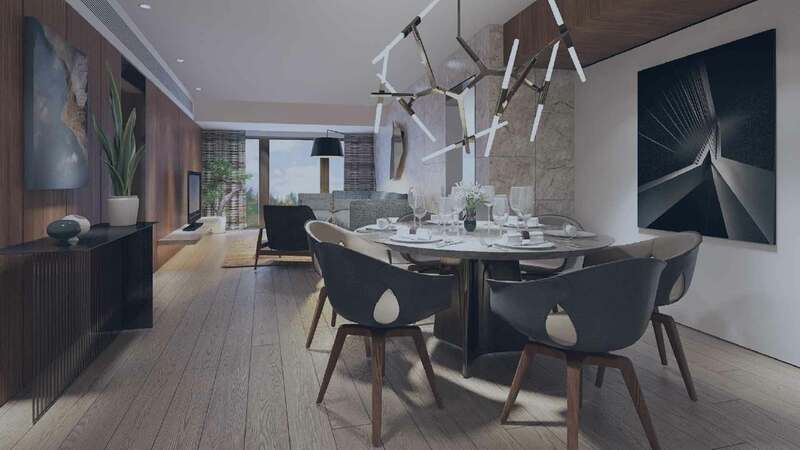 The Shang Residences offers One-bedroom units with a floor area range between 81 to 85sqm, Two-bedroom (142 to 145sqm), and Three-bedroom (231sqm). All units have balconies and have a floor to ceiling height of 2.37 meters, enhancing the abundant circulation of fresh air and the penetration of natural light. The tower has 48 residential floors with two levels of podium lobby and amenities. It also has 5 levels of basement parking where cars are well-secured round-the-clock. Moreover, this upscale condominium also features an exclusive entrance and driveway and a grandiose lobby with aesthetic interiors. Furthermore, the premises are well-secured 24/7 and with CCTV monitoring system (at the lobby elevators, amenities floor, and other strategic places) to enhance security. All units also have an intercom with a direct link to the lobby receptionist. There is also a magnetic lock access card for residential and car park elevators while the property has a centralized fire detection and fire alarm systems. To make you sleep better at night, it is good you know the men and women behind the design and construction of the Shang Residences Mandaluyong. The chief design architects are the well-known Wong Tung & Partners Ltd. and Asya Design Partners, while the interior design was handled by BTR International Limited. The tower’s facade engineering is courtesy of ALT Cladding, Inc., while lighting consultancy service is by Spectrum Design & Associates (Asia). Landscape architecture is being handled by Adrian L. Norman Ltd., while the structural design was performed by Syˆ2 Inc. + Associates (Philippines). The mechanical, electrical, plumbing, and fire (MEPF) designs were done by Isagani M. Martines Consulting Engineer. Shang Properties Shang Residences at Wack Wack in Mandaluyong City, Philippines is a premier Condo project available for sale. If you're looking to rent or purchase Shang Residences at Wack Wack, then check here first. We have full details of Shang Residences at Wack Wack updated regularly as well as everything you need to know about the availing and booking process, broken down into stages that includes selecting a unit, choosing a payment plan and buying your dream home at the right price. For price list, free site tripping or showroom visit, personalized service, model house, unit plans, floor plans, payment terms, CHAT LIVE with an agent 24x7. We are Remax Perfect Homes. Always only buy from PRC licensed Real Estate Brokers and Agents. With an estimated completion date in 2023, the Shang Residences Mandaluyong promises to be one of the happiest places on earth where the family could be proud of. But wait, you could still make good money out of your unit if you don’t want to stay. The residential units at the Shang are also fit for leasing to other end-users and guests. Once you are paying the monthly amortization and the unit is turned over to you, it would be legally your property. You can do anything possible in your unit at the Shang Residences. Investing in a unit at the Shang, you will definitely have a flexible choice (investment-wise). You can opt to give your family the absolute relief of living in a bustling city center with a nature-infused environment or let your unit earn a substantial amount of monthly profit by renting it out. There are more and more people coming and staying in this area of Mandaluyong for leisure and business who wish to live in the city temporarily. The location, expansive, great services, and enchanting residential units are just some of the reasons these guests will rent out your fully-finished suites. Furthermore, industry experts have described Mandaluyong as one of the cities in the metro with the highest rental yields (7.3%) that is why you have a great chance of higher occupancy rate any time of the year. The Shang Residences Wack Wack was launched in 2017 and has an expected turnover date in 2023. This striking condo community brims with an impressive lush landscape as its neighbor you can’t find anywhere else in the metropolis. Shang Residences will not have commercial spaces on its ground floor or in any other spot on the premises. This will make construction quicker and will give more privacy to unit owners. The project is still on its pre-selling stage as of this time, giving you the privilege to enjoy the lowest price offered per unit by SPI during the property’s launching (although there is a little adjustment on prices). More industry experts are advising buyers and investors to make a reservation earlier for any SPI project because of its competitive pricing while the product is on its pre-selling status. One of the advantages of this early reservation is that you will have the chance to pick the best location of your unit where you want the optimum view. Another thing is, you can pay the monthly amortization (if you don’t have ready cash for the whole payment) at the current rate. There are more flexible payment options offered by SPI to own a piece of the Shang Residences Wack Wack for prospective investors and buyers that you will surely love. To know more about how to reserve and other payment options, you can contact our licensed real estate agent on this website for more details. If you will compare the Shang Residences Wack Wack to other condo developments in Mandaluyong City or anywhere else in Metro Manila, for that matter, you will find that the former offers larger floor areas for its residential units. And not only that. Each unit at the Shang Residences Wack Wack provides intimate views of the beautiful surroundings unlike any other. Moreover, SPI provides their clients the ultimate goal of giving them sizable breathing spaces with almost the same price compared to smaller units of other high-end residential developers in the metropolis- especially the Makati area. The larger floor space, along with an impressive unit layout, distinct amenities, and impeccable unit finishes, will give every unit owner the satisfaction that they deserve. The enormous space will surely entail more freedom and utmost privacy for both unit owners, guests, and other end-users as well. Furthermore, upgrading families desiring to see their children in a confined space yet with freedom of movement where they can relax undisturbed is everybody’s dream. Investment-wise, the larger floor area has the best chance to profit more when you decide to lease out your unit. More guests believe bigger is better, especially for the vacationing families. With this in mind, prospective tenants will surely pay higher for their rent. The Shang Properties, Inc. (SPI) is an affiliate of Shangri-La Hotels and Resorts operating all over the world and Kerry Properties Ltd., one of Hong Kong’s biggest property investment and development companies. Kerry has various prime residential and commercial projects across China, Australia, Hong Kong, and Macau. SPI is known in the country as a builder of a community, whether in the metro or in the countryside, that provides a serene environment for residents to unwind, relax, and enjoy the true comfort in living while advancing their careers. Every square meter of the Shang Residences Wack Wack is an authentic interpretation of modern tropical luxury resorts that could be found in some of the best islands in the Philippines. Other than the Shang Residences Wack Wack Mandaluyong, some of Shang Properties, Inc.’s iconic developments include the Shang Salcedo Place Makati, The Shang Grand Tower, St. Francis Shangri-La Place, The Enterprise Center & The Rise in Makati, Shangri-La Plaza, One Shangri-La Place Ortigas Center, and the Shangri-La at the Fort and Horizon Homes in Bonifacio Global City (BGC). Your investment at the Shang Residences Wack Wack will surely go a long long way! The Shang Residences at Wack Wack (SRWW) images displayed on this page are the exclusive proprietary property of Shang Wack-Wack Properties, Inc. (“SWWPI”). Zietwert Inc. is a licensed broker and has been allowed the temporary use of the said images for purposes exclusively of selling the SRWW units. All information pertaining to SRWW units and the SRWW Project on this page are subject to change, and Zietwert’s representations regarding the SRWW Project and its units for sale are solely its own. All current and official information regarding the SRWW Project are available in SWWPI’s official website.